ABSTRACT: I present synthesized sound examples of several atonal expressionist excerpts to illustrate the effect of the altered octave as a sonority. Psychology, linguistics, and literature about 1900 suggest that early atonal expressionist music of Schoenberg and Webern may consist of a polyphony audible as coalescing and dividing sonorities. I argue that ideas about sound perception gathered together by A. S. Bregman under the rubric ofauditory scene analysis provide a way to conceptualize such polyphony,and I propose that the altered octave is a harmonic element crucial inproducing the coalescences and divisions. Such division and coalescence would provide a point of comparison between atonal expressionism and the tonal common practice that Schoenberg and his students discarded. Much tonal music involves an equilibrium between the perception of tones individually and as fused members of chordal sonorities or melodic lines. The nineteenth-century theory of the Klang—which viewed the distinct tones of musical chords as reifications of the normally inaudible partials of a single complex tone—captured the sense that a triad could be perceived as a whole or as a collection of individual tones. Atonal expressionist harmony rarely features the triads of tonality, and its voices should not be expected to combine with the clarity found in common-practice tonality. But in atonal music, several seemingly distinct voices may concertedly produce a striking color, or a blended group of tones may decompose into interesting melodies. In a recent article I argued that Schoenberg meant his word Klangfarbenmelodie to refer to a modern analog to the Klang in which expressionistic harmony could be understood in terms of the variety of tone colors that could emerge when individual tones fused together into sonorities. (8) I suggested that the altered octave (the major seventh or the minor ninth) is crucial in giving many atonal chords this psychoacoustic property. In the present article I demonstrate this function of the altered octave using aural examples. My discussion focuses on the formation of cohesive sonorities that emerge as subdivisions of a musical texture. I pursue it in terms of recent research into auditory scene analysis (ASA). Over the past three decades, a number of psychologists and musicians have investigated a problem most extensively articulated by Albert S. Bregman: How does the auditory system parse complex stimuli into simple sound objects (auditory streams)that correlate with the objects producing the sounds (the objects forming the “scene” around the listener)? (9) This question is closely related to the basic puzzle of early twentieth century empiricists: how do the innumerable messy noises of the world somehow come to make sense, and to resemble reality, as they pass through the mind? The recent studies of ASA offer a relatively successful account of how people hear sounds in terms that would have been recognizable in the early twentieth century. Thus, in this article I interpret the altered octave in the context of ASA in order to suggest that early atonal expressionist compositions are constructed to promote the coloristic blend of separate voices. I approach musical surfaces in terms of perceived psychoacoustic groupings of various tones, using synthesized audio examples and graphic illustrations to illustrate the kinds of groupings that arise. The latter are modeled on the “schematic spectrographs” used by Bregman to illustrate the way the mechanisms of ASA tend to group complexes of sound into integrated perceptual objects. ASA’s perceptual grouping or segregation is rarely absolute. Individual tones may appear weakly grouped, individually discernible but with a sense of linkage, or so strongly grouped that there is no conscious awareness of the actual sounds of the individual tones, merely a sensation of their timbral effects on the global sound. Competition between different possible perceptual groupings can produce uncertainty. In the sound represented in Figure 3a, the simultaneous onset of tones B and C makes them likely to fuse almost into a single perceived sonority characterized by its own timbre. In Figure 3b, however, the pitch proximity of tone A to tone B makes it easier to hear continuity between A and B, while the tendency to hear B and C fused is correspondingly weakened. 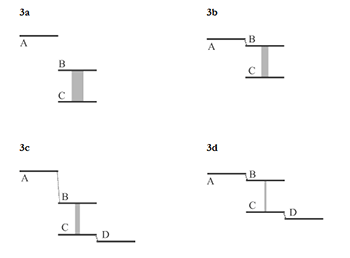 In Figures 3c and 3d, a fourthtone D is added to produce a stream between C and D. Since hearing a stream between tones C and D is inconsistent with hearing tones B and C in the same stream, it becomes harder to hear fusion between B and C, although in Figure 3c it is still possible to experience B as a timbral coloring of C. In Figure 3d, B is easily captured into the stream of A, and it is much more difficult to hear fusion of B with C.
 Whether because of neural properties inherent in the masking or because the critical band coincides with intervals at which beats are maximally “rough,” the critical band is associated with a dissonant “color.” The greatest roughness occurs when one partial is near the edge of the other’s critical band. When partials are well within each other’s critical band (i.e. very close in pitch), there is little roughness; it is almost as if they coincided exactly. 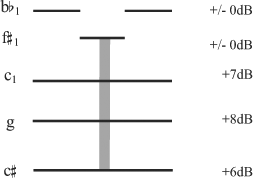 Figure 4 gives an approximate representation of the masking involved in various intervals, with a lower tone in middle treble register such as g1. For traditional consonances such as the M3 and P5, several partials of each tone are not masked, and many of those that are masked are so close in frequency that they do not produce sensory dissonance. The augmented 4th presents little more masking than these consonances, but a greater degree of roughness. In the minor 2nd,masking and dissonance are both high. It is difficult to hear the two complex tones separately from each other. Intervals such as the minor 2, minor 9, and major 7 are highly non-fusing; but I contend that, in early twentieth-century expressionism, the difficulty of perceptually resolving individual tones in these highly masked intervals is a substitute for fusion. Like fusion, such masking can unite several tones into a single perceptual object. (Much other music from the twentieth century also uses traditional dissonances for this purpose.) Schoenberg and Webern, searching for coloristic variety in the progression from one sonority to another, used the characteristic beating and roughness of the altered octave as a color structurally equal to the colors of the traditional consonant intervals. Used in this fashion, the color of an altered octave would no longer merely connote tension requiring resolution. The following informal demonstrations illustrate the interplay of streaming and altered-octave masking. There are two possible ways to hear the sequence F-sharp - B-flat - F-sharp (Sound 5). 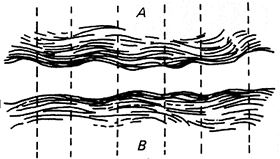 It can be heard as an integrated stream as in Figure 5a, or segregated into two streams as in Figure 5b. 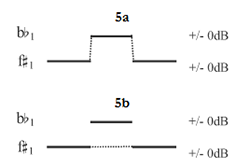 To me, it is easier to hear the single stream shown in Figure 5a than to hear the two streams of Figure 5b, although the latter is also possible. But when a continuous G is added an altered octave below the F-sharp (Sound 6), my hearing changes. It is still possible to hear F-sharp and B-flat in a single stream as in Figure 5a, but it becomes easier to hear the F-sharp in a separate stream from the B-flat, by hearing the F-sharp and G as a single sonority separate from the B-flat (Figure 6). This integration of F-sharp with G may be partly due to the fact that the two tones begin simultaneously. Yet the effect remains if the order of the F-sharp and the B-flat is reversed. 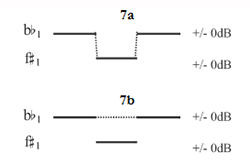 I find Figure 7a to be a more persuasive representation of my hearing of Sound 7 than Figure 7b; yet when G is added (Sound 8), I perceive the F-sharp as a coloration of the G, and above this sonority I hear a stream of pulsing B-flats (Figure 8). In this case, it may be suggested that the G captures the F-sharp more than it captures the B-flat because G is closer to F-sharp than to B-flat. But while this may be a factor, the parsing remains the same when the G is placed above the other two tones. This is heard in Sound 9a, seen in Figure 9, and in Sound 10a, seen in Figure 10. 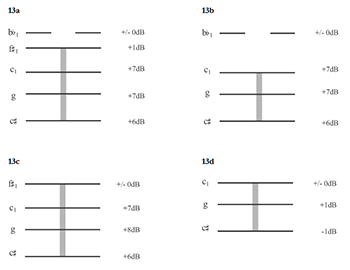 (For comparison, hear Figure 9 without g1 in Sound 9b; Figure 10 without g1 in Sound 10b.) I can only conclude that the altered octave is responsible for the sense of integration. Clearly these demonstrations of this sort can be heard in various ways, and certainly any conclusions drawn from them must remain tentative at least until more formal experimental study. The masking effect of the altered octave is less ambiguous, though, in chords with more tones—for example, in the series of sonorities found in Example 1, the end of Webern’s quartet movement, op. 5, no. 5, from which the previous demonstrations are abstracted. In this passage the first violin leaves and rejoins the underlying sonority. As with the previous demonstration, the changes in sonority can be investigated by means of fast repetition, in which changing degrees of masking and fusion are manifested as auditory stream segregation. The exaggerated comparisons resulting from high-speed repetitions reveal aspects of the sonority that present themselves as subtle but palpable shifts at the music’s actual tempo. In measure 24, the first violin’s F-sharp has a different sense of belonging to the underlying sonority than the B-flat. The F-sharp has an altered-octave relationship with the viola’s G, but the B-flat does not have an altered-octave relationship with any element of the sonority. In addition, the F-sharp is probably significantly masked by the 2nd violin’s C. When the F-sharp is quickly alternated with the B-flat as in Figures 11 and 12, the B-flat stands out from the sonority, but the F-sharp blends in. In Sound 12 at this speed, I hear the F-sharp as part of the sonority that includes the three lower tones, and it is difficult for me to “hear” that in fact the F-sharp begins later than the three other tones. Beneath the B-flat I hear a single sonority; the passage sounds more like Figure 13a than like Figure 13b. No doubt because the F-sharp is masked partly by the C and C-sharp in addition to the F-sharp (none of which masks the B-flat as strongly), this effect is much stronger than the corresponding effect in the earlier demonstration (Sound 7). It may be suggested that the F-sharp appears to belong to the underlying tones not because of critical-band masking but because the example is played too quickly for a stream to be heard incorporating B-flat and F-sharp (as in Figure 7a). As a result, one might argue, an interpretation such as the one illustrated in Figure 13b is heard but mistakenly represented as in Figure 13a. The point, though, is not that at a certain speed B-flat and F-sharp are segregated into separate streams with the result that it is difficult to recognize their temporal relationship. Rather, what is interesting is that when such segregation takes place, the B-flat stands out while the F-sharp is folded into the tones below it. That is, accompanying the b-flat, one hears a sonority made up of the four tones of Figure 13c, instead of hearing a sonority that sounds like Figure 13d. As might be expected, the integration of the F-sharp but not the B-flat is even stronger when the cello’s F is added to the sonority; Sound 14a and Sound 14b confirm this. This means, of course, that five tones are heard together as a sonority as in Figure 14c. Altered-octave masking accounts for the integration of the F-sharp, but other phenomena such as registral distance play roles as well. B-flat stands out partly because it is in a much higher register than all of the other tones, and if it is replaced in the sonority by B-natural as in Figure 15, the B-natural stands out at least as much. The increased interval—F-sharp - B-flat to F-sharp - B-natural—increases the tendency for stream segregation, making the B-natural stand out, despite that the B-natural forms an altered octave with the C-natural. The informal experiments just discussed suggest that it should be possible to perform the passage in such a way as to bring out the connections shown in Figure 16. Below the analysis I have given a drawing showing each sound-object as a line or stream. Separate streams are represented by separate lines, and integrated sounds are represented by single or touching lines. As the figure shows, when the three upper instruments enter, the cello’s F may at first be heard separately, but as the chord is held the F-sharp blends in, changing the timbre emerging from the chord. The violin moves to B-flat, again splitting the mixture into two sonorities. The next gesture begins with the F-sharp alone in the violin (mirroring the cello’s earlier isolated low F). When the other instruments join, the violin stays in its own stream. In the final gesture, the violin again begins as part of the underlying sonority, moving later to B. At actual tempo, these streams are not clear-cut, but they represent a subtle partitioning in the harmonic stream. A particularly nuanced performance might even succeed in using the F-sharp to establish the first violin in a blend that is maintained even when the violin changes pitch, so that the violin’s motion to B-flat and B produces a change in color of the continuous sonority, not a splitting of the sonority. Stream- and color-creation cannot simply be inferred from the score. The fusing of sonorities depends greatly on balance between voices and on other factors in performance. The divided cellos’ accompaniment near the beginning of Example 2, Schoenberg’s orchestral song “Seraphita,” op. 22, no. 1 (1913), is a case in point. (21) The opening diminished fourth in the inner voices expands to a perfect fourth and finally a tritone (Sound 17c). If these intervals can be heard as single sound objects, the passage may be heard as an evolving succession of colors. Their simultaneity indeed promotes perceptual integration, but the fact that they move only in similar motion, not parallel motion, does not. Whether the effect of evolving color is achieved depends on the playing of the altered octaves in the outer voices. Parallel motion between tones increases their fusion. Composers seem to find this principle useful for increasing the perceptual coherence of sonorities with a moderate but not overwhelming tendency to fuse. Thus, in both common-practice and early atonal music, major and minor thirds frequently appear in parallel motion; and altered octaves often appear in parallel motion in early atonal music. In Webern’s orchestral piece op. 6, no. 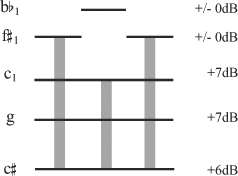 1, measures 2–4 (Example 3), parallel motion fuses the top three tones of the first two tetrachords; in the second chord an altered octave captures the bottom tone as well; and parallel motion fuses the bottom three tones of the third chord. As is shown in Figure 18a, this leaves a low C and a high C free, and in Sound 18a these tones stand out. But the Cs are not entirely free; they form altered octaves with the B of the French horn, as shown in Figure 18b (hear Sound 18b(i) or Sound 18b(ii) with simultaneous onset of horn and cellos). In the demonstrations, the Cs are less prominent when the horn’s B is sounding than when it is not—another way of saying that the Cs start and end as colorations of the B, flowing from the B into the stream of chords and back. During these three chords, altered octaves are the key to associative relationships in which the melodic lines “split, double, multiply, dissolve, condense, float apart, coalesce” like characters in a Strindberg dream play. Although this example shows a clean and simple use of the combination of parallel motion and altered octaves, most instances are not as neat. Altered octaves are often small details in complex, ornate progressions; and there are cases in which the use of the altered octave appears to be a governing principle even though its effect is difficult to precisely hear or predict. Example 4 from later in Op. 6, No. 1 illustrates such a case. Here the d - a - c-sharp - b-flat - b line played by the flute and oboe may function as a compound melody, an instrumental line divided into two perceptual objects through the auditory streaming created by relatively wide melodic intervals. Each “voice” of the compound melody joins another voice of the texture through altered octaves; in a sense, the separate components of the compound melody are harmonically dependent on (that is, coloristically related to) different voices elsewhere in the polyphony. 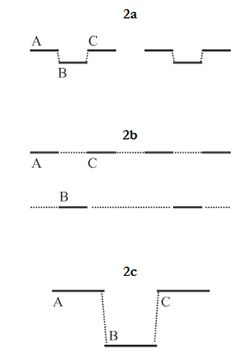 For the first four notes, the high notes are introduced in altered-octave relationships to the triplet melody of the clarinet, bassoon, and pizzicato cellos; the lower tones are related to the B-flat and A of the solo cello. 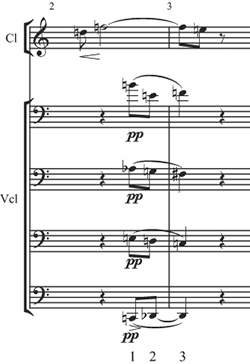 The fifth note, B, fulfils the convergent implications of the compound melody while providing an altered-octave anchor for the newly-entered horns(whose opening pitches, incidentally, alternate in altered-octave relationships with the flute-oboe and the solo cello lines). If it were this simple, the oboe-flute line would be fully explainable in terms of its colorations of, alternately, the cello solo and the clarinet-bassoon-cello lines. But the altered-octave harmonies are brief, lasting only until one voice or the other moves to a new pitch, and many other factors are at work. In Sound 19a (in Example 4), the altered octaves are hard to hear as such. They become a bit easier to hear in Sound 19b, in which rubato lengthens the durations of altered octaves. Several possible interpretations may be competing: hearing the flute-oboe line as one melody or two; hearing it as a perceptually salient melody or as a series of colorations applied to other voices; hearing the altered octave for its acoustic impact or for other properties of ic1. Auditory scene analysis has been promoted for its ability to explain traditional musical elements such as melody and counterpoint. In this article I have drawn on it for a different reason: its ability to move the discussion of harmony beyond the categories implied by such traditional terms. Moving beyond the traditional categories was a chief purpose of Schoenberg and Webern, evident in Webern’s claim that their music ushered in a new era of polyphony (which he called “a new interpenetration of music’s material in the horizontal and the vertical”),(22) evident in Schoenberg’s claim that in modern music the vertical and horizontal were unified,(23) and evident in Schoenberg’s claim that the new sonorities might be explained not in terms of the traditional dimensions of Klang-based harmony and melody but in terms of a fusion called Klangfarbenmelodie. My analyses speak to all of these, positing that in the Viennese School’s polyphony, sonorities of varying color merge and separate, so that at any given moment the total sound is articulated into perceived groupings, much the way a melody over time is articulated into perceived groupings. 1. Judith Ryan, The Vanishing Subject: Early Psychology and Literary Modernism (Chicago: University of Chicago Press, 1991). 2. Saussure, Cours de linguistique générale, ed. Charles Bally, Albert Sechehaye, Albert Riedlinger; trans. as Course in General Linguistics by Roy Harris (LaSalle, IL: Open Court, 1986), 110. 3. William James, Principles of Psychology (Cambridge, MA: Harvard University Press,  1983), 269–73. 4. August Strindberg, “Author’s Note” to A Dream Play, in August Strindberg, Selected Plays, ed. and trans. Evert Sprinchorn (Minneapolis: University of Minnesota Press, 1986), 646. 5. To note a few bits of evidence: The first proper name in Schoenberg’s Harmonielehre is that of Strindberg, cited as a “thinker who keeps on searching” (Schoenberg. Harmonielehre, trans. as Theory of Harmony by Roy C. Carter [Berkeley: University of California Press, 1978], vi, 2). At a gathering in 1909 or 1910, when Mahler suggested that Schoenberg should have his students read Dostoyevsky, Webern, who had been reading Strindberg’s dream plays, retorted, “Please, we do have Strindberg” (Willi Reich Alban Berg, trans. Cornelius Cardew [New York: Harcourt, Brace & World, 1965], 30–32; Hans and Rosaleen Moldenhauer Anton Webern: A Chronicle of His Life and Work [New York: Knopf, 1979], 108–9). Berg told Schoenberg in a letter of December 23, 1911 that he and Webern considered Schoenberg to be Strindberg’s musical counterpart (Juliane Brand, Christopher Hailey, & Donald Harris, eds. The Berg-Schoenberg Correspondence: Selected Letters [New York: Norton,1987], 61). 6. Schoenberg, Theory of Harmony, 422. 7. I have explored early twentieth-century conceptions of mind as a basis for understanding the Second Viennese School’s early atonal music in Cramer, Music for the Future: Sounds of Psychology and Language in Works of Schoenberg, Webern, and Berg, 1908 to the First World War (Ph.D. dissertation, University of Pennsylvania, 1997), 45–57, 297–401. 8. That is to say, I asserted that the common usage of the word Klangfarbenmelodie does not reflect Schoenberg’s intention in coining it. Cramer, “Schoenberg’s Klangfarbenmelodie: A Principle of Early Atonal Harmony,” Music Theory Spectrum 24/1 (Spring 2002): 1–34. 9. Albert S. Bregman, Auditory Scene Analysis: The Perceptual Organization of Sound (Cambridge, MA: MIT Press, 1990). 10. Albert S. Bregman, “Auditory Scene Analysis: Hearing in Complex Environments,” in Thinking in Sound: The Cognitive Psychology of Human Audition, ed. Stephen McAdams & Emanuelle Bigand (Oxford: Oxford University Press, 1993), 11. 11. This demonstration is based on experiments by van Noorden, reported in Leo P. A. S. van Noorden, “Minimum differences of level and frequencyfor perceptual fission of tone sequences ABAB,” Journal of the Acoustical Society of America 61 (1977): 1041–5. Other demonstrations along these lines may be heard in Albert S. Bregman and Pierre A. Ahad, Demonstrations of Auditory Scene Analysis (Compact Disc with booklet. Montreal: Psychology Department, McGill University, 1995; distributed Cambridge, Mass. : MIT Press). 12. David Huron, “Tone and Voice: A Derivation of the Rules of Voice-Leading from Perceptual Principles,” Music Perception 19/1 (Fall 2001): 1–64 [18–19]. 13. Huron, “Tone and Voice,” 19. 14. For a good introductory summary of the factors involved in auditory streaming and fusion, see Huron, “Tone and Voice,” 1–21. 15. For a discussion of a possible neural process by which what is commonly called “melody” can be understood in terms of auditory scene analysis, see Robert O. Gjerdingen, “Apparent Motion in Music?” Musical networks: Parallel distributed perception and performance (Cambridge, MA: MIT Press, 1999): 141–73; revision of “Apparent Motion in Music?” Music Perception 11 (1994): 335–70. A slightly different interpretation of the perceptual significance of auditory scene analysis is presented in Lerdahl, Tonal Pitch Space (Oxford and New York: Oxford University Press, 2001), 81–82. 17. See Albert S. Bregman, Auditory Scene Analysis: The Perceptual Organization of Sound, 488–9 on the timbral consequences of fusion in music and 511 on dissonance as a timbre. 18. Schoenberg, Theory of Harmony, 20–1. I discuss this passage in Cramer, “Schoenberg’s Klangfarbenmelodie,” 9–10. 19. For another application of auditory scene analysis principles to early atonal expressionism, see Fred Lerdahl, “Spatial and Psychoacoustic Factors in Atonal Prolongation,” Current Musicology 63 (1999): 7–26, much of which is restated with more complexity in Lerdahl, Tonal Pitch Space, chapter 8. 20. Huron, “Tone and Voice,” 14–18. 21. 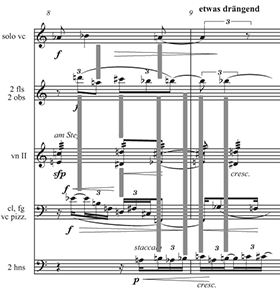 Much of the following analysis, including the analytical diagram, is drawn from Cramer, “Schoenberg’s Klangfarbenmelodie,” 28–29. 22. Anton Webern, The Path to the New Music, trans. Leo Black (Bryn Mawr: Theodore Presser, 1963), 35. 23. Schoenberg, “Composition with Twelve Tones (1),” Style and Idea, ed. Leonard Stein, trans. Leo Black (Berkeley: University of California Press,  1984), 220. Judith Ryan, The Vanishing Subject: Early Psychology and Literary Modernism (Chicago: University of Chicago Press, 1991). Saussure, Cours de linguistique générale, ed. Charles Bally, Albert Sechehaye, Albert Riedlinger; trans. as Course in General Linguistics by Roy Harris (LaSalle, IL: Open Court, 1986), 110. William James, Principles of Psychology (Cambridge, MA: Harvard University Press,  1983), 269–73. August Strindberg, “Author’s Note” to A Dream Play, in August Strindberg, Selected Plays, ed. and trans. Evert Sprinchorn (Minneapolis: University of Minnesota Press, 1986), 646. To note a few bits of evidence: The first proper name in Schoenberg’s Harmonielehre is that of Strindberg, cited as a “thinker who keeps on searching” (Schoenberg. Harmonielehre, trans. as Theory of Harmony by Roy C. Carter [Berkeley: University of California Press, 1978], vi, 2). At a gathering in 1909 or 1910, when Mahler suggested that Schoenberg should have his students read Dostoyevsky, Webern, who had been reading Strindberg’s dream plays, retorted, “Please, we do have Strindberg” (Willi Reich Alban Berg, trans. Cornelius Cardew [New York: Harcourt, Brace & World, 1965], 30–32; Hans and Rosaleen Moldenhauer Anton Webern: A Chronicle of His Life and Work [New York: Knopf, 1979], 108–9). Berg told Schoenberg in a letter of December 23, 1911 that he and Webern considered Schoenberg to be Strindberg’s musical counterpart (Juliane Brand, Christopher Hailey, & Donald Harris, eds. The Berg-Schoenberg Correspondence: Selected Letters [New York: Norton,1987], 61). Schoenberg, Theory of Harmony, 422. I have explored early twentieth-century conceptions of mind as a basis for understanding the Second Viennese School’s early atonal music in Cramer, Music for the Future: Sounds of Psychology and Language in Works of Schoenberg, Webern, and Berg, 1908 to the First World War (Ph.D. dissertation, University of Pennsylvania, 1997), 45–57, 297–401. That is to say, I asserted that the common usage of the word Klangfarbenmelodie does not reflect Schoenberg’s intention in coining it. Cramer, “Schoenberg’s Klangfarbenmelodie: A Principle of Early Atonal Harmony,” Music Theory Spectrum 24/1 (Spring 2002): 1–34. Albert S. Bregman, Auditory Scene Analysis: The Perceptual Organization of Sound (Cambridge, MA: MIT Press, 1990). Albert S. Bregman, “Auditory Scene Analysis: Hearing in Complex Environments,” in Thinking in Sound: The Cognitive Psychology of Human Audition, ed. Stephen McAdams & Emanuelle Bigand (Oxford: Oxford University Press, 1993), 11. This demonstration is based on experiments by van Noorden, reported in Leo P. A. S. van Noorden, “Minimum differences of level and frequencyfor perceptual fission of tone sequences ABAB,” Journal of the Acoustical Society of America 61 (1977): 1041–5. Other demonstrations along these lines may be heard in Albert S. Bregman and Pierre A. Ahad, Demonstrations of Auditory Scene Analysis (Compact Disc with booklet. Montreal: Psychology Department, McGill University, 1995; distributed Cambridge, Mass. : MIT Press). David Huron, “Tone and Voice: A Derivation of the Rules of Voice-Leading from Perceptual Principles,” Music Perception 19/1 (Fall 2001): 1–64 [18–19]. Huron, “Tone and Voice,” 19. For a good introductory summary of the factors involved in auditory streaming and fusion, see Huron, “Tone and Voice,” 1–21. For a discussion of a possible neural process by which what is commonly called “melody” can be understood in terms of auditory scene analysis, see Robert O. Gjerdingen, “Apparent Motion in Music?” Musical networks: Parallel distributed perception and performance (Cambridge, MA: MIT Press, 1999): 141–73; revision of “Apparent Motion in Music?” Music Perception 11 (1994): 335–70. A slightly different interpretation of the perceptual significance of auditory scene analysis is presented in Lerdahl, Tonal Pitch Space (Oxford and New York: Oxford University Press, 2001), 81–82. 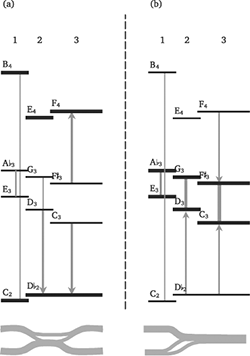 See Albert S. Bregman, Auditory Scene Analysis: The Perceptual Organization of Sound, 488–9 on the timbral consequences of fusion in music and 511 on dissonance as a timbre. Schoenberg, Theory of Harmony, 20–1. I discuss this passage in Cramer, “Schoenberg’s Klangfarbenmelodie,” 9–10. For another application of auditory scene analysis principles to early atonal expressionism, see Fred Lerdahl, “Spatial and Psychoacoustic Factors in Atonal Prolongation,” Current Musicology 63 (1999): 7–26, much of which is restated with more complexity in Lerdahl, Tonal Pitch Space, chapter 8. Huron, “Tone and Voice,” 14–18. Much of the following analysis, including the analytical diagram, is drawn from Cramer, “Schoenberg’s Klangfarbenmelodie,” 28–29. Anton Webern, The Path to the New Music, trans. Leo Black (Bryn Mawr: Theodore Presser, 1963), 35. Schoenberg, “Composition with Twelve Tones (1),” Style and Idea, ed. Leonard Stein, trans. Leo Black (Berkeley: University of California Press,  1984), 220.